Researchers: Corné Kreemer and Geoffrey Blewitt, Nevada Bureau of Mines and Geology and Nevada Seismological Laboratory, University of Nevada, Reno and Elliot C. Klein now at AIR-Worldwide. A model of plate motions and strain rates for 50 major tectonic plates that makeup the Earth’s surface has been refined from about 22,500 horizontal geodetic velocities. The new Global Strain Rate Model (GSRM v2.1) is a significant improvement over previous models because of the large increase of data and an increase in resolution. The model shows plate motions and tectonics, and can also be used as a proxy for the risk of earthquakes within plate boundaries. Strain rate is a measure of the amount that the crust can deform due to tectonic forces. As such, strain rate is a proxy for earthquake potential because as the strain builds, the brittle crust reaches a breaking point and can relieve the strain build-up in an abrupt break or movement across a fault. 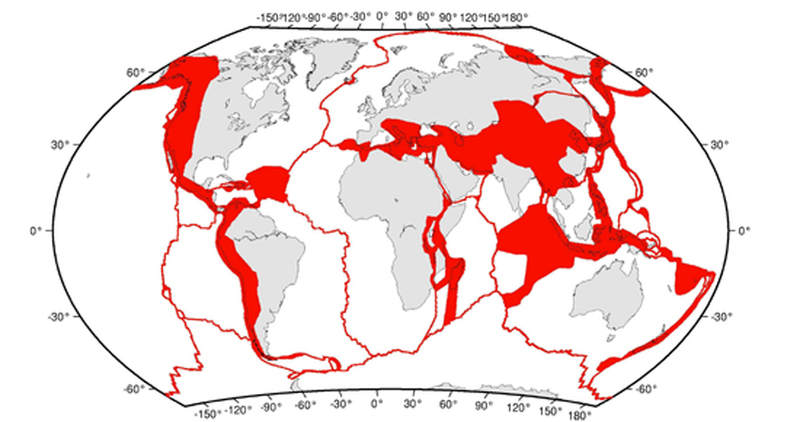 Continuous GPS measurements provide a means to estimate the motion of all tectonic plates and the strain rate in plate boundary zones for the entire globe. UNAVCO maintains thousands of continuous GPS sites and much of the data comes from these stations. The plates are modeled as rigid spherical caps while 14% of the Earth's surface is allowed to deform along plate boundaries. The GPS measurements were collected between 1 January 1996 and 31 December 2013. From these data, the authors derived 6,739 velocities. An additional 15,710 velocities from 233 previous studies were used in the model. Many of these data were gathered in campaigns with UNAVCO support. The results include 36 plates with new angular velocities, global estimates of strain rates, vorticity rates and horizontal velocities, and recurrence times for magnitude 7.5 earthquakes on plate boundaries. The GSRM provides significant insight into plate tectonics, the properties of the crust, the terrestrial reference frame and seismic risk. References: Kreemer, C., G. Blewitt, E.C. Klein, A geodetic plate motion and Global Strain Rate Model, Geochemistry, Geophysics, Geosystems, 15, 3849-3889, 2014 doi:10.1002/2014GC005407.